How can we bring our data into OpenRefine? Create a new OpenRefine project from a CSV file. Understand potential problems with file headers. Use facets to summarize data from a column. Use clustering to detect possible typing errors. Understand that there are different clustering algorithms which might give different results. Employ drop-downs to remove white spaces from cells. Manipulate data using previous steps with undo/redo. In Windows, you can start the OpenRefine program by double-clicking on the openrefine.exe file. Java services will start automatically on your machine, and OpenRefine will open in your browser. On a Mac, OpenRefine can be launched from your Applications folder. If you are using Linux, you will need to navigate to your OpenRefine directory in the command line and run ./refine. OpenRefine can import a variety of file types, including tab separated (tsv), comma separated (csv), Excel (xls, xlsx), JSON, XML, RDF as XML, Google Spreadsheets. See the OpenRefine Importers page for more information. In this first step, we’ll browse our computer to the sample data file for this lesson. In this case, we will be using data obtained from interviews of farmers in two countries in eastern sub-Saharan Africa (Mozambique and Tanzania). Instructions on downloading the data are available here. 1. Click Create Project and select Get data from This Computer. 2. Click Choose Files and select the file SAFI_messy_openrefine.csv. Click Open or double-click on the filename. 3. Click Next>> under the browse button to upload the data into OpenRefine. 4. OpenRefine gives you a preview - a chance to show you it understood the file. If, for example, your file was really tab-delimited, the preview might look strange, you would choose the correct separator in the box shown and click Update Preview (bottom left). If this is the wrong file, click <<Start Over (upper left). There are also options to indicate whether the dataset has column headers included and whether OpenRefine should skip a number of rows before reading the data. 5. If all looks well, click Create Project>> (upper right). Note that at step 1, you could upload data in a standard form from a web address by selecting Get data from Web Addresses (URLs). However, this won’t work for all URLs. filtering down to just the subset of rows that you want to change in bulk. One type of Facet is called a ‘Text facet’. This groups all the identical text values in a column and lists each value with the number of records it appears in. The facet information always appears in the left hand panel in the OpenRefine interface. Here we will use faceting to look for potential errors in data entry in the village column. Scroll over to the village column. Click the down arrow and choose Facet > Text facet. In the left panel, you’ll now see a box containing every unique value in the village column along with a number representing how many times that value occurs in the column. Try sorting this facet by name and by count. Do you notice any problems with the data? What are they? Hover the mouse over one of the names in the Facet list. You should see that you have an edit function available. You could use this to fix an error immediately, and OpenRefine will ask whether you want to make the same correction to every value it finds like that one. But OpenRefine offers even better ways to find and fix these errors, which we’ll use instead. We’ll learn about these when we talk about clustering. Chirdozo is likely a mis-entry of Chirodzo. Ruca is likely a mis-entry of Ruaca. Ruaca - Nhamuenda and Ruaca-Nhamuenda refer to the same place (differ only by spaces around the hyphen). You might also wonder if both of these are the same as Ruaca. We will see how to correct these misspelled and mistyped entries in a later exercise. The entry 49 is almost certainly an error but you will not be able to fix it by reference to other data. Using faceting, find out how many different interview_date values there are in the survey results. Is the column formatted as Text or Date? Use faceting to produce a timeline display for interview_date. You will need to use Edit cells > Common transforms > To date to convert this column to dates. During what period were most of the interviews collected? For the column interview_date do Facet > Text facet. A box will appear in the left panel showing that there are 19 unique entries in this column. By default, the column interview_date is formatted as Text. You can change the format by doing Edit cells > Common transforms > To date. Notice the the values in the column turn green. Doing Facet > Timeline facet creates a box in the left panel that shows a histogram of the number of entries for each date. Most of the data was collected in November of 2016. In OpenRefine, clustering means “finding groups of different values that might be alternative representations of the same thing”. For example, the two strings New York and new york are very likely to refer to the same concept and just have capitalization differences. Likewise, Gödel and Godel probably refer to the same person. Clustering is a very powerful tool for cleaning datasets which contain misspelled or mistyped entries. OpenRefine has several clustering algorithms built in. Experiment with them, and learn more about these algorithms and how they work. In the village Text Facet we created in the step above, click the Cluster button. In the resulting pop-up window, you can change the Method and the Keying Function. Try different combinations to see what different mergers of values are suggested. Select the key collision method and metaphone3 keying function. It should identify two clusters. Click the Merge? box beside each cluster, then click Merge Selected and Recluster to apply the corrections to the dataset. Try selecting different Methods and Keying Functions again, to see what new merges are suggested. You should find no more clusters are found. None of the available methods offered to cluster Ruaca-Nhamuenda with Ruaca or Chirdozo with Chirodzo. To merge these values we need to hover over them in the village text facet, select edit, and manually change the names. Change Chirdozo to Chirodzo and Ruaca-Nhamuenda to Ruaca. You should now have four clusters: Chirodzo, God, Ruaca and 49. Important: If you Merge using a different method or keying function, or more times than described in the instructions above, your solutions for later exercises will not be the same as shown in those exercise solutions. The technical details of how the different clustering algorithm work can be found at the link below. The data in the items_owned column is a set of items in a list. The list is in square brackets and each item is in single quotes. Before we split the list into individual items in the next section, we first want to remove the brackets and the quotes. This will open up a window into which you can type a GREL expression. GREL stands for General Refine Expression Language. First we will remove all of the left square brackets ([). In the Expression box type value.replace("[", "") and click OK.
What the expression means is this: Take the value in each cell in the selected column and replace all of the “[” with “” (i.e. nothing - delete). Click OK. You should see in the items_owned column that there are no longer any left square brackets. Use this same strategy to remove the single quote marks ('), the right square brackets (]), and spaces from the items_owned column. value.replace(" ", "") You should now have a list of items separated by semi-colons (;). Now that we have cleaned out extraneous characters from our items_owned column, we can use a text facet to see which items were commonly owned or rarely owned by the interview respondents. In the Expression box, type value.split(";"). You should now see a new text facet box in the left-hand pane. Which two items are the most commonly owned? Which are the two least commonly owned? Select Sort by: count. The most commonly owned items are mobile phone and radio, the least commonly owned are cars and computers. Perform the same clean up steps and customized text faceting for the months_lack_food column. Which month(s) were farmers more likely to lack food? All four cleaning steps can be performed by combining .replace statements. The command is: value.replace("[", "").replace("]", "").replace(" ", "").replace("'", "") This can also be done in four separate steps if preferred. November was the most common month for respondents to lack food. Perform the same clean up steps for the months_no_water, liv_owned, res_change, and no_food_mitigation columns. Hint: To reuse a GREL command, click the History tab and then click Reuse next to the command you would like to apply to that column. It’s common while exploring and cleaning a dataset to discover after you’ve made a change that you really should have done something else first. OpenRefine provides Undo and Redo operations to make this easy. Click where it says Undo / Redo on the left side of the screen. All the changes you have made so far are listed here. Click on the step that you want to go back to, in this case go back several steps to before you had done any text transformation. Visually confirm that those columns now contain the special characters that we had removed previously. Notice that you can still click on the later steps to Redo the actions. Before moving on to the next lesson, redo all the steps in your analysis so that all of the column you modified are lacking in square brackets, spaces, and single quotes. Words with spaces at the beginning or end are particularly hard for we humans to tell from strings without, but the blank characters will make a difference to the computer. We usually want to remove these. OpenRefine provides a tool to remove blank characters from the beginning and end of any entries that have them. Create a new text facet for the column respondent_wall_type. You should see some choices that appear identical (burntbricks and muddaub both have two choices). In reality, one of these choices includes either leading or trailing whitespace. To remove the whitespace, choose Edit cells > Common transforms > Trim leading and trailing whitespace. You should now see only four choices in your text facet. OpenRefine can import a variety of file types. OpenRefine can be used to explore data using filters. Clustering in OpenRefine can help to identify different values that might mean the same thing. 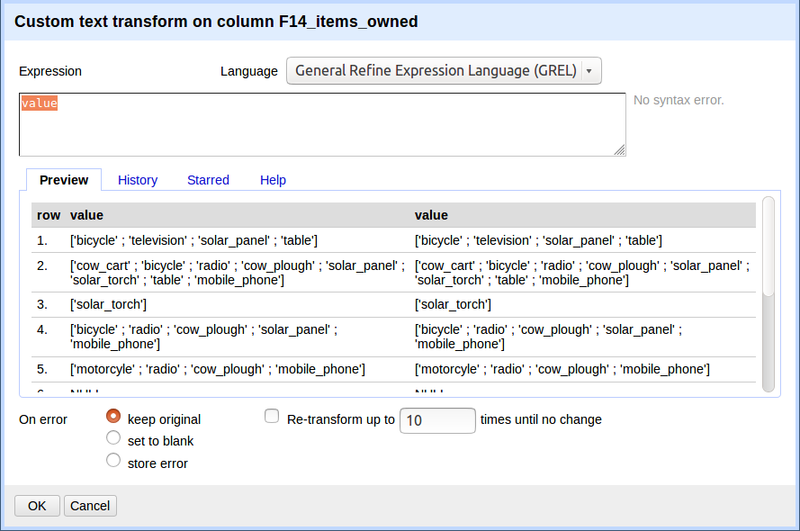 OpenRefine can transform the values of a column.